In 1Q2014, the Aegean Airlines Group, which now includes Olympic Air, reported a reduction in its losses when compared with proforma figures for the same period last year. The acquisition of Olympic has provided only temporary respite from the strong competitive forces in the Greek market: the group's RASK fell in the quarter after growing in FY2013. Happily, CASK cuts more than offset this and hence the narrower losses. On closer inspection, it can be seen that the parent company, Aegean Airlines, saw its losses widen as cost growth outpaced strong revenue growth. The improvement, on a proforma basis, in the consolidated group result is down to significant cuts in capacity and costs at Olympic. Nevertheless, since the group is now managed on an integrated basis, a reduction in the combined losses for the first full quarter after the acquisition is a positive sign. With unit revenues likely to remain under pressure, the group will be looking to acquisition synergies and other cost measures within Aegean itself to ensure that profitability does not deteriorate as the year progresses. In 1Q2014, the Aegean Airlines Group recorded a net loss of EUR8 million. When compared with the proforma result of a year earlier (including subsidiary Olympic Air, which was acquired in Oct-2013, in the prior year period), this loss was reduced by 37%. The EBIT result was a loss of EUR10 million, compared with a proforma loss of EUR18 million. Revenues increased by 1% on a proforma basis to EUR134 million. The group's cash balance increased from EUR227 million at the end of Dec-2013 to EUR276 million at the end of Mar-2014, equivalent to nearly four months of revenues. With debt (in the form of finance lease liabilities) of EUR57 million, the group had a net cash position of EUR219 million at the end of 1Q2014. Much of the group's fleet is financed through off-balance sheet operating leases and capitalising this at eight times annual lease rental payments (assuming that 1Q lease payments are repeated for each quarter) would lead to an adjusted net debt position of around EUR420 million, a little over twice the book value of the group's equity, but only around 70% of its market value. The group increased its ASKs by 5% year on year in 1Q2014 (including Olympic in both periods), while RPKs grew by 8%, so that load factor gained 1.8 ppts from the proforma consolidated level in 1Q2013 to reach 71.0%. The acquisition of Olympic Air has diluted the Aegean group's load factors: in 1Q2013 Aegean recorded a level of 70.5% on its own, while the proforma figure that includes Olympic is 66.2%. For FY2013, Aegean's stand alone load factor was 76.7%, Olympic's was 67.4% and the proforma group achieved 74.2%. 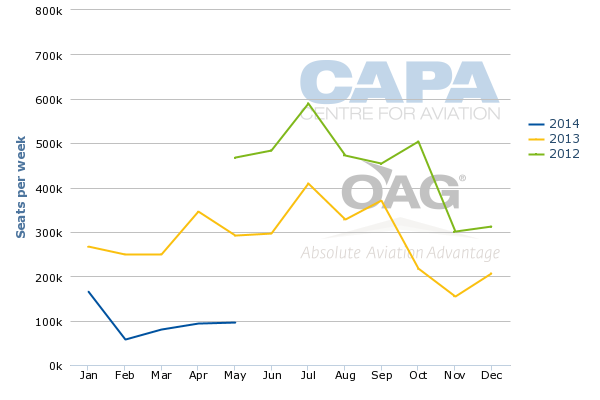 Comparison with the 80% average level achieved by members of the Association of European Airlines points to scope for improvement and the load factor gain in 1Q2014 partly reflects the impact of the group's new pricing policy. The group carried 1.6 million passengers in 1Q2014, a year on year increase of 12% on a proforma basis. This was driven by a 17% increase in domestic passenger numbers, while international traffic grew at the slower rate of 6%. Revenue growth of 1% (on a proforma basis, as if Olympic were part of the group in 1Q2013) was driven by a 77% increase in 'other' revenues. Revenue from scheduled services fell by 5%, in spite of the growth in ASKs and passenger numbers. Passenger revenue per passenger fell by 16%, in spite of a 3% increase in average sector length. The new pricing policy may be growing load factors, but the weakness of average fares reflects strong competition in the Greek market and clearly shows that Aegean is more of a price taker than a price maker. The group's RASK fell by 4% on a proforma basis. The Aegean group's total operating costs (at the EBIT level) fell by 3% on a proforma basis, in spite of the growth in traffic and revenues, reflecting good cost management. Both fuel costs and ex fuel costs fell at the same rate of 3%. Maintenance, ground handling and airport costs fell more rapidly than this, the latter perhaps reflecting a change in the airport mix in the network. By contrast, overflight expenses and, in particular, marketing and distribution costs grew more rapidly than the increase in ASKs. Total cost per available seat kilometre fell by 8% in 1Q2014, and ex fuel CASK fell at a similar rate. Aegean's managing director Dimitris Gerogiannis said in a statement that the integration of Olympic is progressing in line with targets, "with the full synergy and scale economies benefits expected to mature" over the coming year. This suggests that these 1Q2014 results do not yet fully reflect the cost efficiencies expected from the acquisition. In particular, central functions such as commercial, financial, IT and technical are being consolidated into the parent company, with Olympic becoming a pure production unit employing only flight staff. Aegean Airlines' company accounts on a stand alone basis show that its revenues grew by 23% to EUR122 million in 1Q2014. From this and the group results, we can calculate that Olympic Air's revenues fell by a massive 64%. We do not know how the group allocates revenues between the two airlines and this figure for the fall in Olympic's revenues should perhaps be treated with caution. Data from OAG show a 60% year on year fall in seat capacity under Olympic Air's code in the period, but only its Public Service Obligation routes remain under the Olympic code. Other routes previously operated under the Olympic code are now under the Aegean code, regardless of which brand is operating. We can also calculate that the EBIT loss of the Aegean Airlines parent company actually increased by one third to almost EUR9 million. The lower loss for the consolidated group was thanks to narrower losses at Olympic, which, according to our calculations, improved its EBIT result from a loss of EUR11 million to just short of breakeven (loss of EUR1 million). The increase in the parent company's 1Q losses is clearly not something that management will want to see becoming a trend, but it is early days post acquisition and the focus seems to have been on reducing the losses at Olympic. Moreover, following the acquisition in Oct-2013, the networks of the two airlines are being managed on an increasingly integrated basis and the focus should be on the consolidated results. Nevertheless, the table above highlights the progress made in improving the profitability of Olympic, albeit in exchange for a massive reduction in its size. In a company presentation dated Apr-2014, Aegean set out its plans for its network in 2014. Although international passenger growth (6%) in 1Q2014 was slower than domestic growth (17%), the group intends to continue the international expansion that has been its focus. Total capacity, in ASKs, is expected to grow by 11% to 13%. The 2014 group fleet, at 50 aircraft (36 A320 family jets and 14 Bombardier turboprops), is larger by five than in 2013 and the new base at Chania means that it has eight bases in Greece. It now has 47 international destinations from Athens, up from 32 in 2013. Athens remains the group's largest base, with 19 Airbus aircraft, 13 turboprops and 38 international destinations. International tourist arrivals by air in Athens were 25% below their 2007 peak in 2013, but grew by 3% compared with 2012. For the rest of Greece, tourist arrivals by air in 2013 were 17% above their 2007 level and for Greece as a whole the increase was 5%. Aegean now sees an opportunity to benefit from the recovery in the Athens market. In addition, it hopes to increase its market share at its Greek leisure bases. This is based on the fact that the group's share of seats across all its bases is 17% for Jun-2014, compared with the average share of 33% for the largest carrier in European countries (source: Aegean presentation Apr-2014, quoting figures from OAG). Aegean argues that its low share gives it room to grow, particularly in its leisure bases, where its share is in single figures in most cases. Certainly, there is room for market share gains, but the challenges are considerable. Aegean/Olympic faces growing competition from the main European LCCs. Ryanair only established operations in Athens at the start of the summer 2014 schedule and already has a 7% share of all seats and a 14% share of domestic seats (week of 26-May-2014, source: OAG). Moreover, it also lacks the long-haul networks enjoyed by the largest carriers in many other European countries. In 2013, Aegean managed a strong improvement in profits to record its best margin since its 2007 flotation. In our Mar-2014 report on its FY2013 results, we noted that the jump in profits was due to a strong RASK increase, but cautioned that further growth in RASK looked unlikely. See related report: Aegean Airlines’ annus mirabilis, but can it maintain the momentum in 2014? Indeed, the Aegean group's RASK fell by 4% in 1Q2014. Thanks to cuts in Olympic, its CASK fell at the faster rate of 8% and so the seasonal losses typical of 1Q were narrowed. The likelihood is that the competitive forces in the Greek market will continue to place downward pressure on pricing and RASK. Unit cost reduction, not only from the acquisition synergies, but also from within the parent Aegean Airlines, will be the key to maintaining the momentum in 2014.